Photo measuring 5.75 x 3.5 inches. This is another of those photos that lends itself to making up your own background story. Where are they? Who are they? 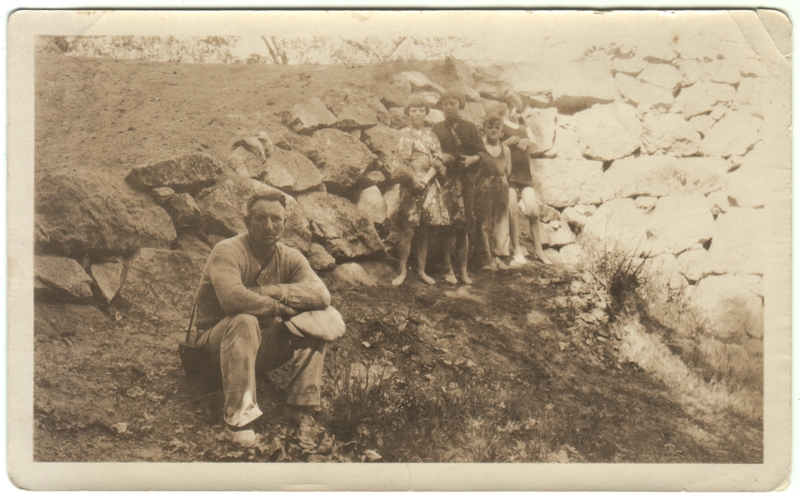 Is the man connected to the children, and if so, why are they retreated into the background? If they aren’t connected, why are they all framed in the photo? Are the kids all wearing swimming outfits? The girls on the left seem to be in some sort of flowery kimono-style robes, possibly covering bathing suits. What’s in the bag over the man’s shoulder? Here’s my version, which is pure guesswork. The man and a companion were out for a stroll down to the water to do some nature watching, perhaps birding. I think those are binoculars in that bag. Perhaps it’s a man-made lake with a retaining wall, or a river that flows under a stone bridge. He stops to rest by the shore, where some local kids are swimming in their favorite watering hole. As he’s resting, the man’s companion decides to take a photo. Curious, the children lurk. Perhaps they have already struck up a conversation, but back up because they suspect they aren’t wanted in the photo. Amused by the children, the companion includes them in the shot anyway. Or I’m sure there are plenty of other possibilities here. Great imagination, Matt! I do not know why, but to me this picture has an eerie quality. I get that eerie quality, too. Maybe in part because of the mistiness of the image. Or maybe because nobody is smiling.